Hot yoga is usually practiced in a room at around 40 degrees celsius and trust me... it's hot. Most people wouldn't even sunbathe in temperatures like that so imagine exercising in such heat. As you can imagine, some people are sceptical about the practice and whether it can cause more harm than good. One of the main risks associated with it is that people may go beyond their limits. In an article written in Science Daily, Diana Zotos, Yoga Instructor and Physical Therapist in the Rehab Department at the Hospital for Special Surgery, Manhattan says that "The heat makes people feel as if they can stretch deeper into poses and can give them a false sense of flexibility". As a result "this can lead to muscle strains or damage to the joint". It makes sense, your body pushes itself that little bit further because it thinks it's more flexible than it really is and you are causing more damage. Another issue with hot yoga is dehydration. It is essential that you drink plenty before, during and after the session because you are losing a lot of fluid with sweat. If you don't drink lots of water this can lead to many problems linked to dehydration such as fainting. Furthermore, "The heat factor also puts more strain on the heart and challenges endurance" so if you do have any health problems it may be best to consult your doctor first and make sure you're physically fit enough before taking part. 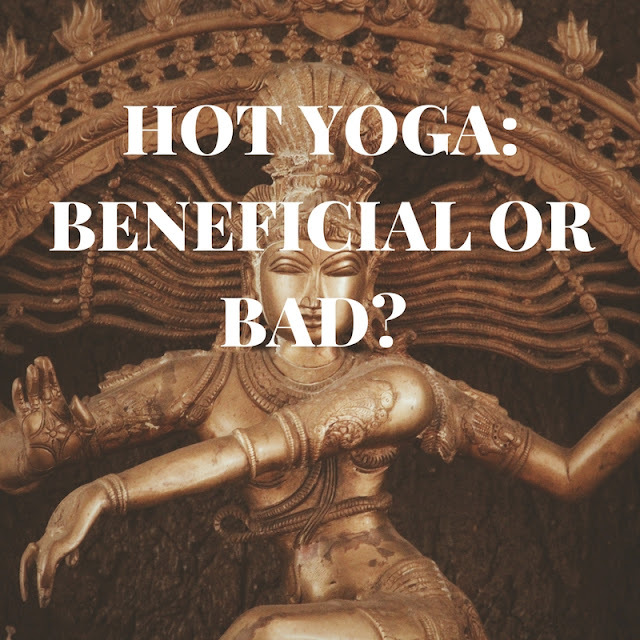 However, there are also potential benefits to hot yoga. In a study performed on adults participating in hot yoga for 8 weeks, they found that there were reduced symptoms of depression, a better quality of life and optimism. I will admit, once you've done the class, you leave feeling refreshed and like you've just had a fantastic stretch as well as a good workout, so it's not surprising that these results have come through. However, the study was only tested on 29 adults, therefore larger studies need to be done before these results can be set in stone. The conclusion of this post is that we don't really know if there are any real risks to hot yoga but if you do have any health issues, make sure to speak to your doctor before taking a class. Like any workout, hot yoga is a good way to get exercise into your daily routine and may have benefits on your mental health as well.